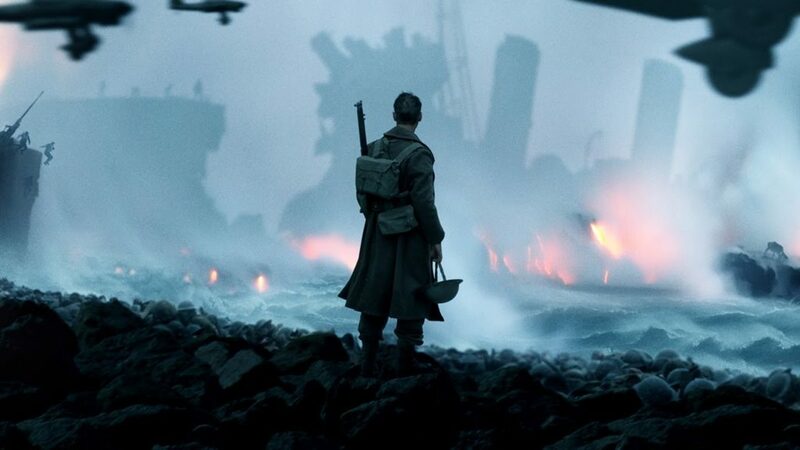 With Dunkirk, Christopher Nolan has switched gears into a genre he’s never explored before, the war film, with a docudrama depiction of the Dunkirk evacuation (named after the French town where it took place), where 300,000 British soldiers with their backs against the sea were rescued by an armada of civilian volunteers, including fishing boats and private yachts, in what became known as “the miracle of Dunkirk” (despite being a retreat, the mass rescue was so unlikely that Winston Churchill himself cautioned the celebratory mood by stating that “wars are not won by evacuations”). Perhaps partly because it focuses on an Allied retreat, perhaps partly because no Americans were involved (Dunkirk took place over a year before the United States entered the war), the Dunkirk evacuation hasn’t gotten much Hollywood attention; the only high-profile film I can recall even touching on it is Atonement, and that only in one sequence. For the venerable writer-director, Dunkirk showcases his often-cited greatest strengths and weaknesses perhaps more starkly than ever before; a technically virtuoso filmmaking accomplishment but emotionally cold. Dunkirk may strongly appeal to WWII buffs, but its appeal to mainstream audiences is in doubt. The Longest Day-style, Dunkirk cuts back-and-forth (not always in chronological order) between an ensemble of characters on the beach, on ships, and in the sky, giving a 180 degree overview of the evacuation (the film divides itself with title cards denoting “land”, “sea”, and “air”). It’s the summer of 1940, and the German conquest of France has driven the British armies sent to aid the French back to the beaches with their backs against the sea and what’s left of the French army struggling to hold an ever-shrinking perimeter. Insofar as we have a central protagonist, it’s young soldier Tommy (Fionn Whitehead), who falls in with two others, the silent Gibson (Aneurin Barnard) and belligerent Alex (Harry Styles), as they endure a harrowing series of mishaps trying to get onboard a ship (preferably one that isn’t sunk out from under them by a U-Boat or dive bomber) and make it back to England. Meanwhile, Mr. Dawson (Mark Rylance) sets sail in his pleasure yacht with his young son Peter (Tom Glynn-Carney) and Peter’s friend George (Barry Keoghan), joining a fleet of other civilian volunteers cruising toward Dunkirk to do what they can to rescue soldiers, but en route they pick up the shell-shocked sole survivor (Cillian Murphy) of a U-Boat attack, who’s not happy to learn he’s heading back into a war zone. And overhead, a Spitfire squadron led by Farrier (Tom Hardy) struggles to hold off the Luftwaffe and stop them from bombing the evacuating soldiers or the ships coming to rescue them. As is to be expected from Nolan, Dunkirk is impressively technically accomplished. There are wide-panning shots of the types used in epic films of the ’60s and ’70s like Patton or Lawrence of Arabia, and a sweeping aerial shot showing the thousands of men lined up along the length of beach. The dogfights recall those in 1969’s The Battle of Britain, cutting between different camera angles to keep the action interesting. Nolan favors the intimate over the epic, showing bombings and ship sinkings from close-up first-person perspectives of the soldiers on the ground. There is no graphic violence, but his portrayal of bombings and sinkings is sufficiently intense that one doesn’t feel like he’s watering down. And while the storyline(s) is exceptionally simple and straightforward by Nolan standards (it also runs a comparatively slim hour and forty-six minutes, far shorter than his norm), that doesn’t mean he’s abandoned his fondness for non-linear film structure. The “Land”, “Sea”, and “Air” sequences are not taking place in exact chronological order with each other; we see aerial dogfights from first inside Hardy’s cockpit, and later we see the same sequence from the perspectives of those on ships below, and we see a destroyer sinking from three perspectives: Farrier overhead, Dawson from a distance as he rushes to pick up survivors, and Tommy and friends from inside. This non-linear approach, which Nolan has used effectively elsewhere and is something of a trademark, feels like an unnecessary directorial flourish here and makes some of the sequence of events difficult to follow. While Dunkirk‘s strength is its technical aptitude, its weakness is in character (or lack thereof). The characters are not developed enough to allow strong identification with anyone. The dialogue, especially in the Tommy/Gibson/Alex sequences, is spare and terse, which lengthy stretches in which nary a word is spoken, and some of Tom Hardy’s lines are garbled behind his flight mask (following The Dark Knight Rises‘ Bane, this is the second time Hardy has done a role for Nolan which involves his face being masked for the majority of his screentime). This, and Nolan’s trademark clinical, vaguely Kubrickian emotional aloofness, keeps the characters at a distance. Despite the epic backdrop, Dunkirk is lean and tightly-focused, its narrative as bare bones as its characters. We get only a brief encounter with French soldiers early on, and the Germans are faceless, distant enemies, inside their fighters swooping overhead or represented by artillery bombardments. This is not an actors’ movie, but the ensemble is effective with what they’re given. Young unknown Fionn Whitehead, who has little dialogue, is our main focal point on the beach, and while it’s hard to make a judgment about the acting abilities of Harry Styles (of British boy band One Direction), he fits in seamlessly here and there’s nothing to give away that he has no previous acting experience. The supporting cast includes some notable names, including some who’ve worked with Nolan before (Tom Hardy and Cillian Murphy) and some who haven’t (Mark Rylance and Kenneth Branagh). Insofar as there can be said to be a “standout”, it might be Mark Rylance’s Mr. Dawson, driven by an unshakable sense of patriotic duty to drive his pleasure yacht into a war zone to do whatever he can to help, but this isn’t an acting showcase. Nolan regular Michael Caine (who has appeared in every Nolan film since 2005’s Batman Begins) stays offscreen, but provides a vocal cameo as a voice over the radio. In a way, Dunkirk is Nolan giving himself a challenge and attempting a kind of movie he’s never done before, but I can’t think of any previous starker example of his greatest strength and greatest weakness laid bare side-by-side. I was left admiring the film’s level of superlative technical accomplishment but feeling cold by its emotional coolness and lack of character identification. There are moments of immediacy, such as a downed fighter pilot struggling to break open his cockpit as it floods with water, or the sinking of the destroyer as seen from the inside (it’s worth noting that a Dunkirk veteran who attended a screening was forced to walk out by its realism but later praised its authenticity), but the overall immersion is lessened by the film disallowing us to really find a character to strongly care about. In the end, one is left technically admiring Dunkirk but feeling it’s not as rousing or powerful an experience as it could have been.